Tamil society led by the Great Man used to take great pride in breaking Ganesha idols and burning Rama portraits (to symbolize a break with Brahminical hegemony). The Dravida movement was perhaps even more focused on rooting out all Hindu traditions (superstitions) than the communists. Even a few years ago Karunanidhi was calling Hindus thieves. The Chief Minister of the state, J Jayalalitha celebrated her 66th birthday yesterday the 24th February 2014. All over the state, posters and hoardings of the leader were put up by her enthusiastic admirers and party workers. 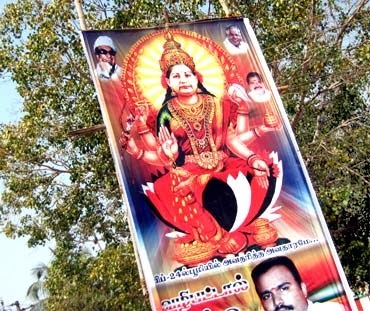 One of the posters portrayed the Chief Minister as Goddess Lakshmi. Last year when Rajinikanth had a quiet 63rd birthday, one poster put up by a few overenthusiastic fans had both his fans and the superstar in trouble. The controversial poster depicted the Superstar standing in a queue to cast his vote and the Gods Ganesha and Vishnu standing in the same queue, squeezed among other people. A religious outfit was outraged by this depiction of Rajinikanth, and promptly lodged a police complaint. The same Ganeshas that were being destroyed earlier have now re-incarnated (resuscitated) as Rajnikanth the living God. As an outsider it appears to me that the symbolic (and not so symbolic) expulsion of Tamil Brahmins has perversely led to the dominant Shudra communities being relaxed about superstitions, image worship and the rest. On top of this you have now Tamil hindus complaining about blasphemy. Karunanidhi is calling Modi a hard worker and a good friend. The whole thing is of course very silly but quite sinister as well.